Udaipur offers a large number of grand forts and exquisite palaces that bear testimony to Indias rich architectural heritage. » Lake Palace and Lake Pichola - Lake Palace is a shimmering granite and marble structure that overlooks the aquamarine waters of the Lake Pichola. It is a harmonious arrangement of pavilions, courtyards, terraces, rooms, corridors, and hanging gardens. According to legend, the eight marble porticos that mark the spot where the Mewar sovereigns were weighed in gold, the equivalent value of which was then distributed to the poor. » Bhim Vilas Palace - The Bhim Vilas Palace that lies within the City Palace has a series of lovely wall paintings. The Mor Chowk is known for its stunning peacock mosaics. » Jag Niwas and Jag Mandir - The summer residence of the princes of Mewar was called Jag Niwas, and is today a magnificent luxury hotel. Jag Mandir, the other island palace has a marble dome and is made in red sandstone. It was a refuge for the Mughal Emperor Shah Jahan when he was exiled after a quarrel with his father, Emperor Jahangir. » City Palace and Museum - The imposing City Palace towers over the Pichola Lake on a hill and is the largest palace complex in Rajasthan. the complex manages to retain a uniformity of design despite being a conglomeration of buildings constructed by various Maharanas over a long period of time. It has many courtyards, pavilions, terraces, corridors, rooms and hanging gardens. » Saheliyon-Ki-Bari - To the north of the city lies Saheliyon-Ki-Bari, a garden of the maids of honour. This small ornamental garden has many fountains, delightful lotus pools, chiselled kiosks and marble elephants. » Jagdish Temple - The Jagdish temple was built in 1651 by Maharana Jagat Singh. Built in Indo-Aryan style , the temple is the largest temple of Udaipur. A black stone image of Lord Vishnu and a brass image of Garuda can be seen here. » Bhartiya Lok Kala Mandir - Bharatiya Lok Kala Mandir, the Indian folk arts museum, has interesting exhibits that include folk dresses, ornaments, puppets, masks, dolls, folk musical instruments, folk deities and paintings. Puppet shows are held here daily. 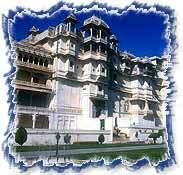 There are a very large number of places that can be visited when on a tour of Udaipur. » Ahar - Ahar is the ancient capital of the Sisodias that lies about three kilometers from the town of Udaipur. It boasts of numerous chhatris or cenotaphs that commemorate Mewars royalty. 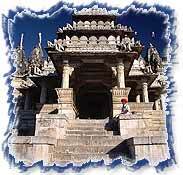 » Ranakpur - Ranakpur boasts of some of the most exquisite Jain temples in the country. » Sajjangarh - Sajjangarh is a dramatic 18th century palace that gives a breathtaking view of the Mewar countryside, and lies on a hilltop just outside Udaipur. It was initially intended to be a five-story astronomical center, but was later abandoned and used as a monsoon palace and hunting lodge. » Eklingji - Eklingi is set in a deep ravine containing the Eklingji Lake about 22 km from Udaipur. The Ekalinga temple here is made of white marble with a two-storey mandapa to Shiva. » Nathdwara - Nathdwara is an important Hindu pilgrimage center that lies 48 kilometers from Udaipur. 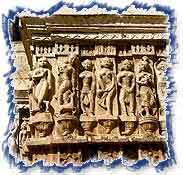 It is also famous for nurturing the glorious tradition of Pichwal paintings. » Nagda - Nagda has three temples dating back to the 11th century-Adbhutji Temple and the Vaishnavite Sas-Bahu Temples-all dating back to the 11th century. » Chittorgarh - Chittorgarh is one of the oldest cities in Rajasthan. It was capital of the legendary Sisodia Dynasty of which Rana Pratap and Rana Kumbha were the kings. Its majestic fort dominates the city. Most of the attractions are located inside the walls of the fort. Kumbhalgarh, Ghanerao, Rajsamand Lake, Jaisamand Lake, Sardarsamand, Haldighati, Dungarpur, Narlai, etc are the other historical places worth visiting near Udaipur. The city of Udaipur is connected by regular flights to Delhi, Jaipur, Jodhpur, Aurangabad, and Mumbai. It lies on the Western Railway meter gauge network, and is connected to Delhi, Chittor, Ahmedabad, Jaipur, Ajmer, and Jodhpur. We offer complete travel and tour packages that are inclusive of hotel booking, air booking, and car-hire, services, for the entire duration of your stay in the Mewar city of Udaipur. Udaipur offers some irresistible shopping opportunities. The better known items include folk toys, brightly colored garments, hand printed textiles, batiks, dyed saris, metal images, silver jewelry, and the Pichwal wall hangings. Udaipur has a tropical climate with temperatures ranging from a maximum of 38.3°C to a minimum of 28.8°C during summers. Winters are slightly cold with temperatures between 28.8°C to 11.6°C. the winters months between September and March are the best period for visiting Udaipur.